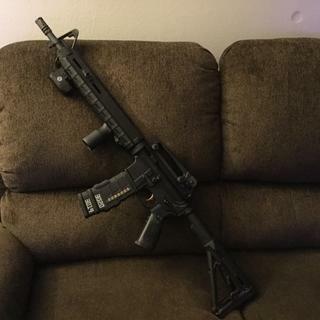 The best part of this rifle is the full length Mlok magpul handguard. Plenty of room for accessories. I mounted a Crimson trace LiNQ wireless green laser/tactical light. I’ve only shot 300 rounds through it yet but not one problem. Definitely recommend. •MOE™ Dissipator: Rifle length sight radius means accuracy. OAL: 32.5''.